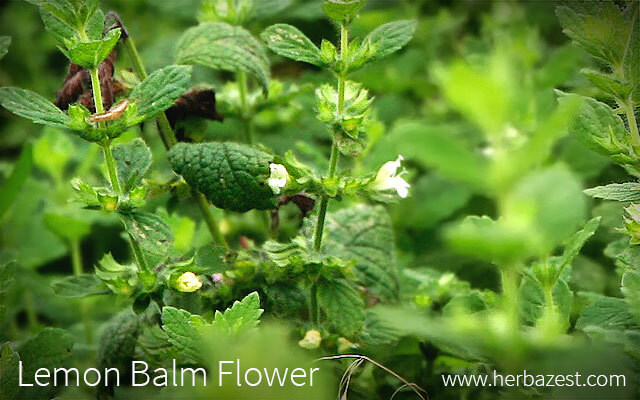 The lemon balm flower is inconspicuous and grows in tiny clusters where the leaves meet the stem. It may be yellow, white, pinkish, purplish, or bluish. Although the leaves are the most commercialized part of the plant, the flower of lemon balm is crucial for its propagation and it also attracts pollinators to the garden. As an unfortunate consequence of herbicides use, the honeybee population has declined by about 50% over the past several decades. This is significant because one-third of the planet's food supply depends on honeybee pollination. It has been demonstrated that bees favor lemon balm flowers that are in the blue-lavender-purple range of color. Contrary to the popular tradition of harvesting before the plant blooms, many beekeepers allow lemon balm to flower, not only to attract the bees but also to prevent the migration of the swarm. The flower of lemon balm is harvested together with the stems and leaves of the plant to obtain essential oils, as well as for preparing a liquid extract and an aromatized water. All of these lemon balm byproducts have medicinal and therapeutic applications. Lemon balm flowers have a few culinary applications. They can be candied or used to garnish fruit salads, beverages, or rice. They can also be added to whipped cream with sugar and fresh peaches or strawberries. Additionally, lemon balm flowers have a minor ornamental importance, usually as a part of a garden design that includes other perennials. They have also found a use in vintage bouquets that combine wildflowers and fragrant, flowering herbs. While the leaves of lemon balm are the most appreciated part of the plant, the flower of lemon balm plays a very important role in the propagation of the species because it produces seeds, attracts pollinators, and its delicate fragrance and inconspicuous presence contribute not only with the garden design as a whole, but also to the environment.